Wanna have some HOT and SPICY food? Please don't hesitate to visit my blog. Its a combination of Indian, American Southwest and some Filipino cuisine. And for those who wants Desserts and Sweets my blog is just RIGHT for you guys. Remove skin of pork. 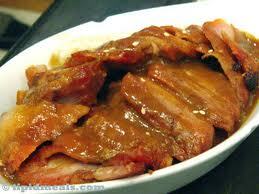 Put toyo and sugar in the pork. Add garlic and water, and then boil in slow heat until pork is tender. Remove from fire & slice pork. You can serve with fried potatoes and boil green beans. And add string onions on top of the finished product. Good for 4 to 6 servings.